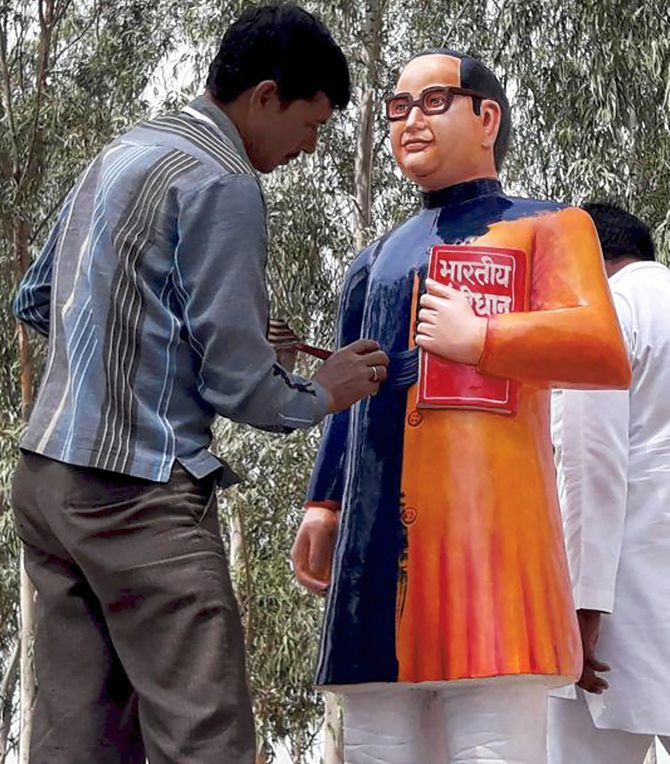 A freshly installed 5-foot-tall statue of Dalit icon Bhimrao Ambedkar in saffron jacket in Badaun district of western Uttar Pradesh was repainted blue on Tuesday amid questions over the choice of a colour associated with Hindutva. 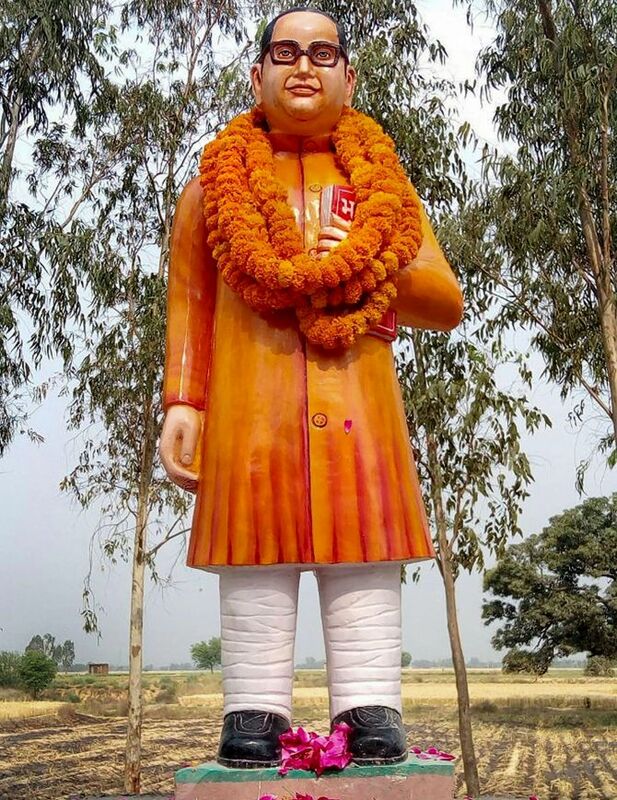 The saffron-attire statue in Kuwargaav village was a replacement for a smaller Ambedkar statue that was damaged Friday night by some anti-social elements. However, the local administration had it re-painted blue this morning, an official said. Sub divisional magistrate-Sadar, Parasnath Maurya said, "The previous statue of Babasaheb, shortlisted by a committee of the police and district administration, was barely three feet high. Later, a saffron statue was selected. The cost of this statue was Rs 22,000 and it was paid for by the committee." Asked about the saffron hue, the SDM said, "The committee members had brought blue paint along, but the statue was installed before giving it a blue coat. Today, the statue has been repainted in blue." However, the incident, reminiscent of an earlier episode where the state Haj Committee office boundary wall was painted saffron and then repainted white, prompted opposition parties to take pot-shots at the ruling Bharatiya Janata Party, which has often been accused of 'saffronisation'. "It was the BJP people who had forced Babasaheb to leave Hinduism and embrace Buddhism, and today these people are enacting a drama of adopting Babasaheb. Till today, Babasaheb's statue used to be either blue or white, but these people gave a saffron colour to the statue and made an effort to damage the dignity of Babasaheb. The disciples of Babasaheb are feeling angry," Samajwadi Party leader and Badaun MP Dharmendra Yadav said. Bahujan Samaj Party district chief Hemendra Gautam explained the first priority was to install the statue. "Our first priority was to install the statue, so we did not bother about the colour," he said adding a request that the administration should paint it a blue since it had been installed. "When Babasaheb embraced Buddhism his dress was of saffron colour. The colour of rising Sun is also saffron," Gautam said. However, others like Kalicharan, the head of Ambedkar Suraksha Samiti, were not ready to accept the saffron colour. It was on Kalicharan's complaint that a case was registered against a person for allegedly damaging Ambedkar's statue, police spokesperson said. A constable was also suspended in this regard, the spokesperson said. On April 7, the statue at Ambedkar park in Kuwargaav was found damaged. Superintendent of Police Kamal Kishore said the police had covered the vandalised statue with cloth and initiated a probe into the incident. Why was I so under informed about Dr Ambedkar?